This is intended to be exactly as it’s titled, a crash course in crate training. I’m sparing you any and all the anecdotal evidence, science, and in depth behavioral explanations. All that junk will find its way into a separate article when I get bored, which never happens because Im far too busy putting together content you can actually use. Dogs and especially puppies, need to be taught how to exist in our homes and in our lives. Almost every post I make or video I record, has a moment, or two, or three, where I explain the importance of teaching. So many folks are either in a rush to get to the end result or they simply don’t know there are steps they need to go through. When I get a question about a dog destroying things in the house, or pooping and peeing in all sorts of creative and inconvenient places, I end up writing about crates and crate training. One of the BIGGEST mistakes folks make is giving their puppy too much freedom. Listen, it takes time to learn the rules of the house. No puppy under a year can be expected to have all those rules down. Those rules must be taught to the puppy. Having a puppy loose, unsupervised, is one of the worst things you can do for their development. You can’t have your stuff torn up, and you certainly don’t want your home smelling like dog toilet. Most of the time when people say they are having problems, they also are NOT using a crate or any type of confinement for the puppy. Oh your puppy sleeps in bed with you? Which honestly is a bit cruel because the poor pup has NO CLUE what you want from it, yet you are not doing anything with regards to effectively teaching the dog. Get a crate. Get a GOOD crate. This is not something to skimp on as it is going to be your dog’s very special place. I really like solid, heavy duty, plastic crates. There is a wide variety of them on the market and you get what you pay for. There are some really cheap ones out there that a determined dog with some separation anxiety will just eat right through. If you have a dog who you already know has issues, click HERE for the best crate on the market. I have zero affiliation with them and get nothing back from endorsing them. Feel free to mention my name and they will have no clue who you are talking about. The wire crates are just too easy to get destroyed. Another added negative about wire crates is the damage the dog can do to itself trying to get out. I have seen some nasty wounds on dogs ripping through wire crates, and I have heard some even worse horror stories. Plus, if the dog has any type of poop accident in there, and it gets on the bars, good luck cleaning each and every little wire. Been there, done that, never again. 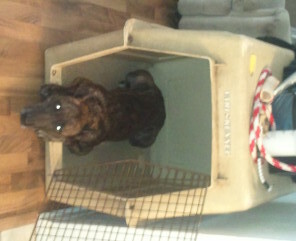 You can always start to teach your dog any behavior you want, including being comfortable in a crate. The key is, as with any other behavior, that it is “taught”. I mentioned this earlier, and I’ll pound it into you repeatedly. If we do not teach the dog using clear communication methods, you will have problems getting the dog to understand and become comfortable with the behavior. Crate training is best started on a weekend as you have the opportunity for more time to prepare them for the first workday. Start by letting the dog know the crate is a great place. Just like we do with all other new behaviors, we will use the dog’s undeniable desire to eat to help us with this process. Cut off all food from a food bowl. We want to use the food to teach the dog to love the crate, so we need to be in control of the food at this point. Take the dog’s daily food amount and put it aside in a container or in a bag where you have access to it. Go over to the crate and toss a few pieces of kibble into the back of the crate. As you do this say a word or phrase you will use to tell the dog in the future to go in the crate. I have always said “kennel up” but feel free to be creative..
At this point you are going to leave the door open so the dog can go in and out. Do about 5-7 repetitions of tossing a couple pieces of kibble into the crate. Then go outside for some water and let them go to the bathroom followed by some play time. Go back inside and now you are going to get them used to the door being closed. Start closing the door behind them for a moment while they snack on the kibble. Then progress to closing the door and leaving it closed for a small period of time. One of the single most important parts of crate training is ensuring you are not positively reinforcing any barking or whining that will inevitably take place. You must realize, if the dog makes any noise while in the crate, and you so much as walk over to the crate, let alone open the door, then what you are doing is TRAINING THE DOG TO BARK! You opening the gate or even walking UP to the gate while they are making noise will reinforce their behavior. If you are unfamiliar with that concept you need to click HERE to learn more. When they start barking you MUST ignore them. Once they quiet down, THEN open the door. This will teach the dog that the door is only opened if they are silent. If you have already begun crate training and the puppy now is clean and quiet in the crate, yet still goes in the house, you have made one of the most common mistakes out there. For the first 8-12 months of a puppy’s life and time with you, you must not allow the puppy to be UNSUPERVISED IN THE HOUSE!!! I can’t stress this enough. The puppy is either outside, in the crate, or playing with you. If you need to make a sandwhich or take a phone call, put the puppy in the crate or outside. Otherwise you are inviting an accident, and then the puppy achieves success at the very behavior you want to go away. Using positive punishment, or “reprimanding/correcting” the puppy for that type of mistake is one of the most ineffective ways to handle the situation. This is very confusing for the puppy. Just because you clearly know why you are correcting the puppy doesn’t mean THEY know. More than likely they are completely unaware of when they are in trouble. This creates a situation where you puppy will lose trust in you, which has dire consequences for your relationship down the road. Remember, crate, outside, or inside and playing WITH you. Once you have the puppy or adult dog comfortable going in and out as well as staying in there quietly, you MUST set a schedule. Consistency is KEY here folks and I can’t stress that enough. You have to pick times of day where you know for a fact you will be able to take the puppy out no matter what. The idea is that we are using the dog’s natural instinct to NOT go the bathroom where it sleeps. The only reason the dog will hold it though is if it TRUSTS that you will be opening that door at a certain time that it can look forward to. They might not be able to read a watch but they have an internal clock that puts Swiss Time to shame. Another MAJOR rule here is ALWAYS exercise the puppy before putting them in the crate for an extended period of time. We want to drain as much energy as possible before expecting them to chill out in their little cave. Please leave a sturdy and tasty chew toy in there to occupy them if they start to feel froggy. A kong with some peanut butter or homemade chicken liver pate’ smeared on the inside, then tossed in the freezer overnight is a GREAT idea. Also big beef shank bones with the marrow from the butcher work well here also. Take the puppy outside before putting it in the crate, and when taking the puppy OUT of the crate, go straight outside. No play, no fooling around, just silence until they go to the bathroom. THEN praise and play. We want the puppy to understand that nothing fun happens until AFTER they go to the bathroom. You will appreciate this concept greatly when its -20 degrees F outside in January and they think its time to play. Well into your dog’s life they will benefit from still having the crate around. Even long after they are housebroken, if the crate was introduced properly the dog will see it as a safe and comfortable place. There are certain times when I do feed in the crate. If for some reason we don’t finish the day’s rations during training, I will use the crate for the rest. Bottom line, the crate is a great tool to use when living with a dog in your home. However you must realize that the goal is for the crate to be a “bedroom” NOT the dog’s entire “home”. The crate is a tool to teach the dog the rules of the home in a reasonable way as you gradually allow them to earn more freedom. The crate is not something that a dog lives in, they live in your HOME, not the crate!